This afternoon just before question time, Prime Minister Malcolm Turnbull is expected to honour Harold Holt as we approach 50 years since his disappearance off Cheviot Beach. So far, 2017 has passed with little acknowledgement of Australia’s 17th prime minister and his achievements. The half-century anniversary of the 1967 referendum on Indigenous rights was celebrated with scarcely a mention of his name, even though it would likely have never happened without Holt’s support. It is Holt’s misfortune, and our own, that he is now better remembered for the unusual circumstances of his death than for his life. Although not even prime minister for two years, Holt left a legacy that helped shape modern Australia—from his winding back of the White Australia policy, to his support for constitutional change to recognise Indigenous Australians as citizens, his advocacy of the arts, and of course his contributions to foreign policy. Unlike Robert Menzies, who regarded himself as much British as Australian, and saw no contradiction in it, Holt was unambiguously Australian. This was reflected in his approach to foreign affairs. Holt the diplomat is best remembered for his unfortunate yet misunderstood ‘All the way with LBJ’ quip, which I wrote about  in The Strategist earlier this year. Holt’s rich history of engagement with Asia, his use of personal diplomacy to strengthen ties between Canberra and regional partners, and his efforts to place Asia front and centre in an Australian imagination that still looked so often to Britain and America are too often overlooked. While Labor mythology tells us that Australian engagement in Asia began in 1972, history tells a different story. An examination of Holt’s 1966 and 1967 speeches reveals the PM talking about the coming ‘Asian century’ almost 50 years before the term was in vogue. Gough Whitlam himself acknowledged that Holt made ‘Australia better known in Asia and made Australians more of aware of Asia than ever before’. Holt did this by making visits to Asia, meeting its leaders, getting to know them and their concerns and, in his own words, making ‘Australia and its policies better known’. He did this in a way that Menzies never could, building personal relationships with the leaders of South Korea, Thailand, Singapore and Malaysia, among others. Aided by his efforts to dismantle the White Australia policy, Holt was received warmly in Asian capitals. His statement to Cambodia’s Prince Norodom Sihanouk that ‘geographically Australia is part of Asia’ was a radical departure from the outlook of the Menzies years. Holt regarded Asia with both hope and trepidation, but above all with a sense of necessity. In 1967, he argued that ‘our greatest dangers and our highest hopes are centred in Asia’s tomorrow’. When UK Prime Minister Harold Wilson informed Holt of his final decision to end the British presence in the region, Holt appealed not to imperial nostalgia or familial ties but to London’s self-interest and the opportunities of the future. It was, he wrote, ‘like turning one’s back on life’. There’s some irony in the fact that 50 years after this turn from Asia and embrace of Europe, London is in the process of divorcing itself from the EU and again courting our region. The chief foreign policy challenges that Holt faced 50 years ago have a resonance in the uncertainty of our region today. Allies are showing an ambivalence about their commitment to the region, while expecting Australia to step up its role as a security contributor. As Britain was in the process of withdrawing forces from Southeast Asia, it implored Australia to fill the void. As the US escalated its military commitment in Vietnam, it made it clear that it expected Australia to follow suit. The record of Holt’s management of these challenges is mixed. 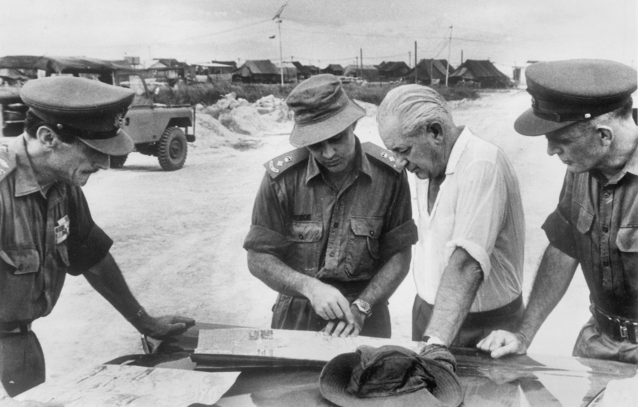 While preventing the British withdrawal ‘East of Suez’ was beyond the power of any Australian leader, the evidence suggests that Holt put Canberra’s case effectively and persistently and that he navigated the rapidly changing situation well. However, in Vietnam Holt pursued policies that overemphasised the military component of the mission. He linked Australia’s troop increases to his personal relationship with President Johnson, and to the US–Australia trade relationship. In doing so, he locked Canberra in to an escalation trap in which Johnson came to expect automatic troop increases in line with his own. Holt found himself unable to articulate a clear rationale to the public for a war that, while initially popular, soon appeared to be open-ended and futile. Nevertheless, the intimacy of Holt’s association with Johnson became the envy of several of his successors, and a kind of benchmark for judging subsequent leader-to-leader relations between Canberra and Washington. It is inevitable that in the history of Australian foreign policymaking Holt is dwarfed by both his immediate predecessor Menzies and his eventual successor Whitlam. However, he should not be overlooked. Nor should Holt be remembered simply for a few ill-chosen words delivered on the White House lawn. Beyond that is a rich, if half-forgotten, legacy of Asian engagement and stewardship of Australia’s great-power relations during a period of transition that can serve as a useful point of reference for us today. Cam Hawker is a PhD candidate at UNSW Canberra, where he is completing a thesis on Australian prime ministers and the US alliance. He’s a presidential associate of the Australian Institute of International Affairs and was previously a staffer with the Australian government. Edited image courtesy of the Australian War Memorial.